Worship starts at 9:00 am. We have a great time together worshiping God and encouraging each other. Each week we share together in singing, prayer, teaching and communion. Bible Classes for adults are from 10:40 to 11:30 am. There are always several classes for adults every Sunday. “IMPACT” for is from 10:30-11:30 in the Youth Room for students from seventh through twelfth grade. 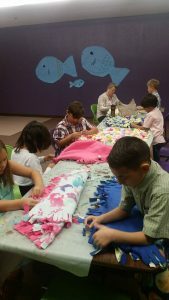 Bible Classes for kids of all other ages are held in the Uptown wing from 10:20 to 11:30 am. Teens Nights Together (TNT) usually hosted at the church building or member’s home from 6:00 – 7:30pm. This is a time when students get to hang out with each other, play games, listen to a devotional and have dinner prepared by one of the many fantastic cooks of our church. During the school year we meet from 6:00 to 7:00 pm for a Wednesday Evening Dinner & Devotional. We’ve been averaging about 80-100 people for a fantastic homemade dinner each week cooked by our very own in house Chefs of the congregation. Feel free to call the church office for more information at (559) 439-9530 and please join us!